I recently had the opportunity to interview Charles Duhigg about how you can use habits to stick to your New Year’s resolutions. Charles is a Pulitzer prize-winning reporter for the New York Times, and the author of the bestselling book, The Power of Habit. The paperback version is available on store shelves pretty much everywhere today. When I spoke with Duhigg, he talked about how you can break down every single habit into three components. “There’s the cue, which is the trigger for an automatic behaviour to start, and then the routine, which is the behaviour itself, and then finally a reward.” And there has been quite a bit of neurological research to back that up. “When cue and a behaviour and a reward become neurologically intertwined, what’s actually happening is a neural pathway is developing that links those three things together in our head.” That’s why habits are so sticky, and why bad habits are so hard to break. Even though it’s difficult to break a habit (research has shown that it’s way easier to change an old habit instead of trying to extinguish it–more on that in a bit), it’s possible to use the science of habit change to your advantage to either introduce new habits into your life, or change existing, hard-wired behaviours you’re tired of. I personally think that one of the first things you should do after you make a New Year’s resolution is convert it into a habit. For example, instead of making a New Year’s resolution to work out more, form a habit to go for a 15-minute walk to a coffee shop and back every lunch hour. Or instead of making a resolution to lose weight, make a resolution to swap out your sugary morning latte with a green tea. But that’s way easier said than done, and so one of the things I asked Charles was how to form a brand new habit. The answer, it turns out, is to define a few “cues” to trigger the habit, and then to reward yourself after you follow through with the habit “routine”. To adopt a new habit, Duhigg recommends that you “think deliberately about the cues and rewards you want to establish in your life that will encourage good behaviour”. It’s easiest to illustrate that with an example, like making a New Year’s resolution to exercise more. “Let’s say you put your running clothes next to your bed so you see them when you wake up in the morning, and you schedule to go running on Wednesday’s at 8:30 in the morning with one of your best friends.” That example includes a few triggers, including a time of day, a certain place, and the presence of certain people. After you define a few cues to trigger your new habit, you should then establish a way to reward yourself for completing the routine. Charles touched on how difficult it can be to routinize new behaviours. “Even if you think you want to start exercising, your brain essentially thinks that you’re a liar and that you don’t actually like exercise. So what you have to do is train your brain so it knows that exercise is linked to something you know that you enjoy, like a piece of chocolate, taking a nice long shower, or spending 15 minutes on Facebook. It doesn’t matter what the reward is. What matters is it’s genuinely rewarding, and that you allow yourself to enjoy that reward. Rewarding yourself after you go through with a routine is how you should solidify the cue, routine, reward sequence in your head. For example, Duhigg suggested that “when you start an exercise habit and you get home from your workout or your run, you should eat a small piece of chocolate”. That may sound like counterintuitive advice on the surface, but when a genuine reward helps you so much in solidifying a habit, it’s no doubt sound advice in the long-run. After you plan a few cues that will trigger a habit sequence, as well as properly reward yourself afterward, over time you will have to invest less time and willpower into keeping your resolution. Though you may need to be patient while you form new habits, with sufficient cues and a satisfying reward, over time your behaviour will become much easier, and increasingly automatic. Just like adopting a new habit, to change an old habit you should start by identifying a cue and a reward, but you should “find a new behaviour that seems to correspond to them” (a new routine). Duhigg recommends that you keep the cue and the reward as similar as possible, because habits can be so ingrained in your brain. It’s pretty hard to will ourselves into changing our brains. Cues are pretty easy to identify (because they fall into one of the five aforementioned categories), but rewards can be trickier to identify. For example, let’s say you have a habit of walking to a vending machine at work every afternoon. Your cue is likely the time of day, but the reward your brain is seeking out is more difficult to pinpoint. For example, are you craving some food because you’re hungry? Or are you craving a break from your work, or a way to make your afternoon more interesting? According to Charles, it’s only “once you identify what reward you’re genuinely craving [that] you can change the behaviour.” Depending on what reward you’re actually seeking in this example, your best substitute behaviours could range from eating an apple if you’re hungry, to taking a walk outside if you need a break, to surfing Facebook for 15 minutes if you’re looking for some novelty. Charles talked about how one of the most important parts of keeping habits is “anticipating where the breakdown will occur”, and anticipating any obstacles you will face along the way to achieving your goals. “An obstacle often is very easy to deal with ahead of time, and very hard to deal with at the moment it occurs. 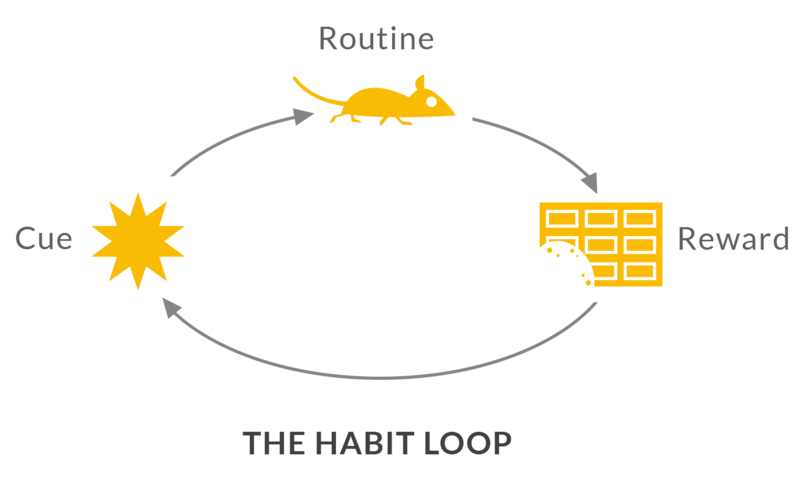 Study after study shows that if you [use the habit loop and anticipate obstacles], you’re much more likely to successfully build a new habit”. An obstacle often is very easy to deal with ahead of time, and very hard to deal with at the moment it occurs. Towards the end of our interview, when I asked Charles Duhigg what one productivity tip he would give to someone in the new year, he talked about how important it is to think deliberately about how your life works. Understanding your habits is no doubt one of the best ways to become more aware of, and take control over what is driving your behaviour in the New Year. The Power of Habit is available in paperback pretty much everywhere today. I highly recommend it.